KAZAN, January 25. /TASS/. The contract for delivery of ten modernized cruise-missile-capable bombers Tupolev-160M will total 160 bln rubles [$2.9 bln], Russian President Vladimir Putin said on Thursday at a meeting with the staff of Kazan’s Gorbunov Aircraft Plant. "A contract for ten aircraft is to be signed shortly," the president said. "Each jet will cost more than 15 bln rubles [$ 0.27 bln] and the overall contract will total 160 bln rubles. This means the factory will be operating at full capacity through 2027. There will be plenty of things to do." One of the workers expressed hope that component suppliers would not let the factory down in this project. "They haven’t so far," Putin replied. 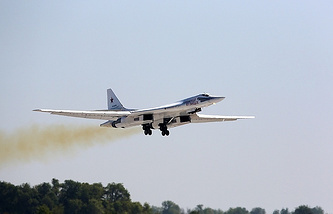 He added that the refueling jet, the Ilyushin-78, made its first trial flight in the city of Ulyanovsk, in the Volga Region, earlier in the day. "This indicates that our aircraft manufacturing continues to develop," Putin noted. He also said he did not have any doubts whatsoever about the timely completion of the forthcoming contract, adding that the composition of the factory’s personnel, which had a large enough number of young workers, offered great optimism.